Although it's quite obvious after listening to The 69 Eyes that their style owes a little more than a lot to a certain Australian rock group it never been more apparent then with their new album Back in Blood. Originality might not be the first thing that comes to mind when you first listen to The 69 Eyes, after all, half the tracks contain the words blood, dead or undead, but Back in Blood is somewhat original and quite good. The 69 Eyes call themselves gothic music mixed with rock and roll. This is somewhat true. I'm reminded of a band like Nightwish crossed with AC/DC, then crossed with AC/DC a couple more times until not much of Nightwish remains. It's entirely possible to find gothic influences in the album but most of them will just be rock and roll influences wearing scary masks. 'Back in Blood' sounds like it's Australian counterpart and 'Lips of Blood' like 'T.N.T.'. Of coarse there's more to Back in Blood than cheap rip-offs. 'Dead Girls are Easy' has a great application of wah effects and 'The Good, The Bad & The Undead' is a extremely catching. 'Kiss Me Undead' probably contains the most gothic music influences. It even has a bit of power metal if you listen close enough. Other highlights include 'Some Kind of Magick' and 'Suspiria Snow White'. It's AC/DC but creepier! Actually there's a lot more to The ^9 Eyes' Back in Blood than meets the eye. It's nice to see a band who actually trying something a bit different. The best gothic rock n� roll band out there? Then again I don't know of any others. 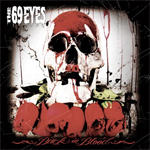 Originality might not be the first thing that comes to mind when you first listen to The 69 Eyes, after all, half the tracks contain the words blood, dead or undead, but Back in Blood is somewhat original and quite good.